The country's economy grew by 6.9 per cent in the first quarter of the year, beating analysts' estimates of 6.6% growth. 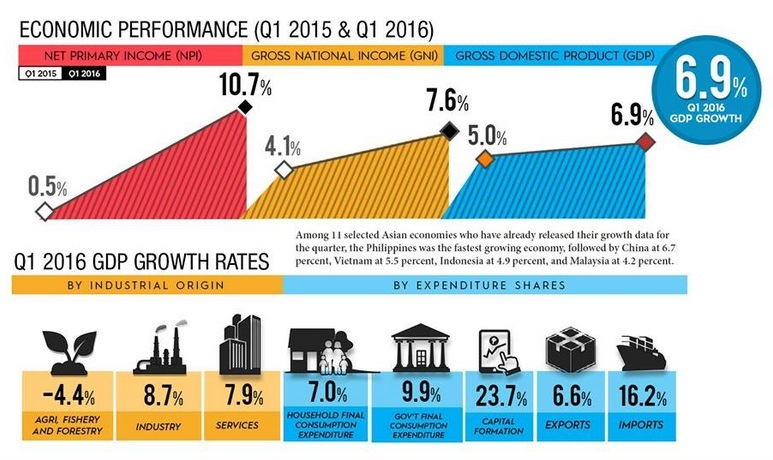 The country's first quarter growth rate is the highest among 11 Asian economies that have released their GDP figures so far. Following Philippines is China at 6.7 per cent, Vietnam (5.5%), Indonesia (4.9%), and Malaysia (4.2%). Finance Secretary Cesar Purisima said that it's the first time in 27 years that the Philippines outpaced China's growth. This bodes well for the economic growth in the next quarters, says National Economic and Development Authority (NEDA) chief Emmanuel Esguerra. The likelihood of achieving the full-year target of 6.8 to 7.8 per cent has increased, with the robust growth in the first quarter. In his statement, Esguerra says that the "return of political and economic stability" are the key factors which led to the socioeconomic progress for the past five years. Esguerra explained some points on the performance of the economy. He said that on the demand side, growth was investment-driven. Fixed capital grew at 25.5 per cent while construction grew at 12 per cent, almost triple the 4.5 per cent growth registered in the same period last year. Public construction saw a dramatic reversal, surging to almost 40 per cent compared to the 23 per cent contraction last year. On the supply side, the industry and services sectors were the top performers. The industry sector grew at 8.7 per cent, the highest in five consecutive quarters. Meanwhile, the services sector grew at 7.9 per cent. In contrast, the agriculture sector, contracted by 4.4 per cent. Esguerra explained that El Nino had reduced the agricultural output, comparable to the 1998 episode. Esguerra is hopeful that the economic agenda of the incoming administration will "build on the gains of the last five years".